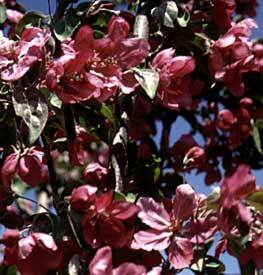 We carry a large selection of flowering crab trees for that peak spring color! Many bare fruit and also retain their fruit throughout the winter, adding interest to your landscape, as well as attracting birds. purple-bronze foliage and bright flowers rival ‘Liset’. to scab, fireblight and cedar-apple rust. spring. Very disease resistant and nice foliage. shape. The foliage is purple fading to bronze-gr. tree. Reddish green, glossy foliage. spring and boldy stand out against the dark foliage. Brilliant cherry red fruit maturing to ½” size in fall. White flowers and bright shiny green leaves. Very fragrant. Showy golden brown bark.